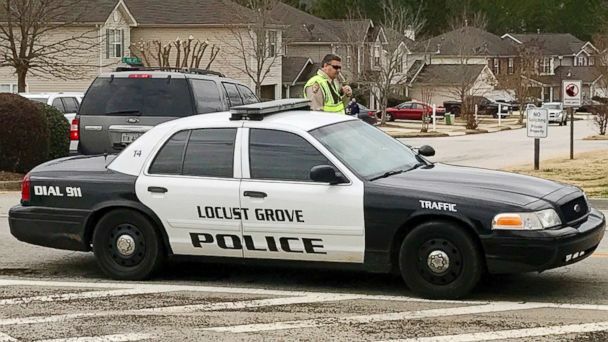 A police officer is dead and two sheriff's deputies are injured after they were shot while attempting to serve an arrest in Henry County, Georgia, Friday. The two Henry County sheriff's deputies arrived at the home on St. Francis Court in Locust Grove early this morning to serve the arrest warrant and soon realized they would need backup, so they radioed for help, Henry County Sheriff Keith McBrayer said in a press conference. A Locust Grove officer then arrived on the scene to assist. But while trying to serve the warrant, an altercation broke out, according to the sheriff, and all three officers were shot. The Georgia Bureau of Investigation has identified the officer who died as Chase Maddox of the Locust Grove Police Department. GBI also identified the two wounded deputies as Michael D. Corley and Ralph Sidwell "Sid" Callaway. "The Locust Grove police officer died shortly after at the hospital. One sheriff's deputy is in serious condition and in surgery right now at Atlanta Medical [Center]. The other sheriff's deputy is in fair condition at Atlanta Medical," McBrayer said. When asked about reports that the warrant stemmed from a traffic violation, McBrayer said he was not sure. The suspect is deceased, according to the sheriff. Georgia Bureau of Investigation spokesperson Nelly Miles said officials are still notifying next of kin before identifying the suspect. "It is a very emotional time for the Henry County community," Miles said. There were other people in the residence at the time of the shooting, the sheriff added, but none of them were injured. Both sheriff's deputies were wearing bulletproof vests at the time of the incident, McBrayer said. "You never know what's going to happen when you take someone into custody," he added. GBI is currently investigating the incident.